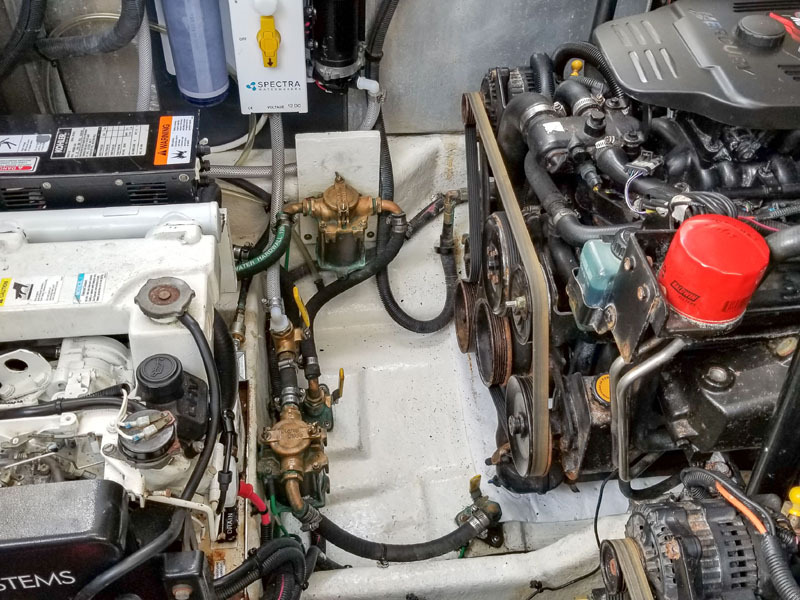 A one owner (USGC Captain) lovingly cared for and upgraded, documented boat. 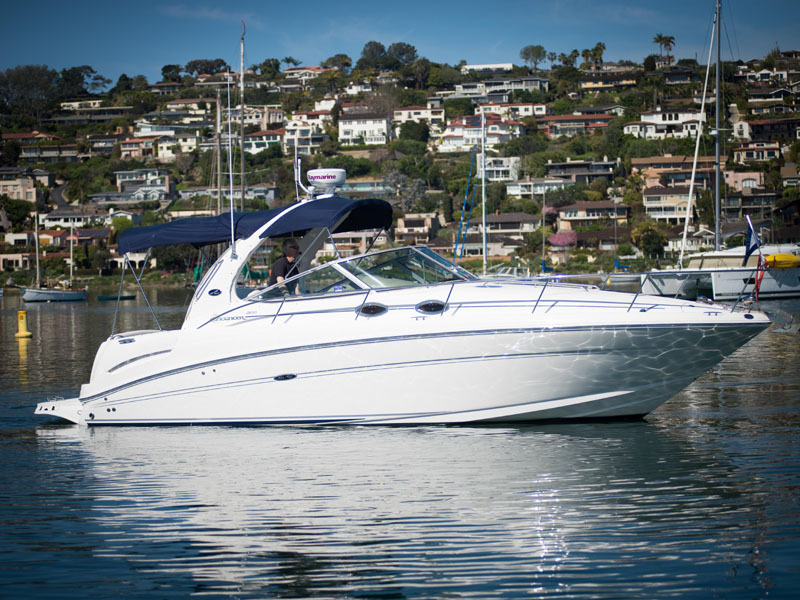 Great for harbor cruising, harbor hopping or extended adventure cruising. The boat has been towed by the owners to various places in the US and launched for cruises (among other places) into the NE Canadian and US waters as well as Ketchikan AK. 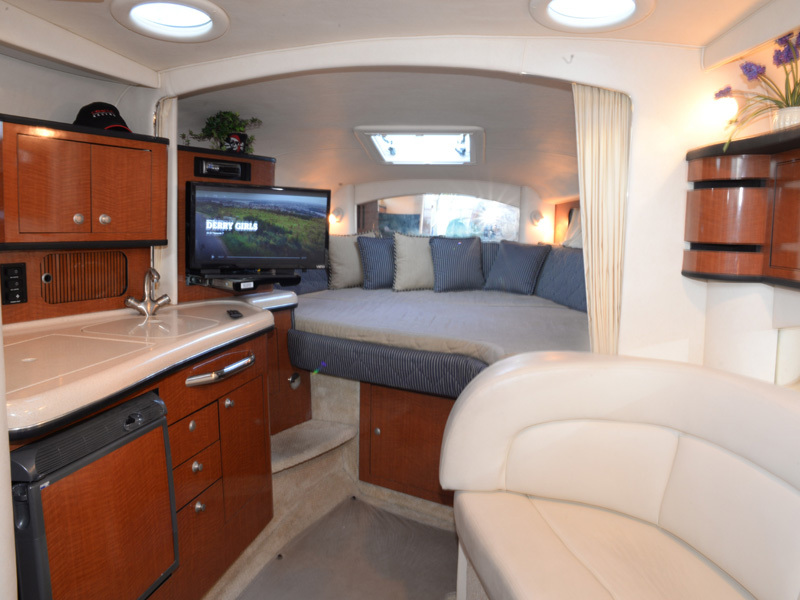 The fore and mid cabin sleeping areas create an ideal extended cruising configuration for a couple! The extremely knowledgeable and experienced cruising couple owners have maintained this boat continuously in ready to cruise fashion. 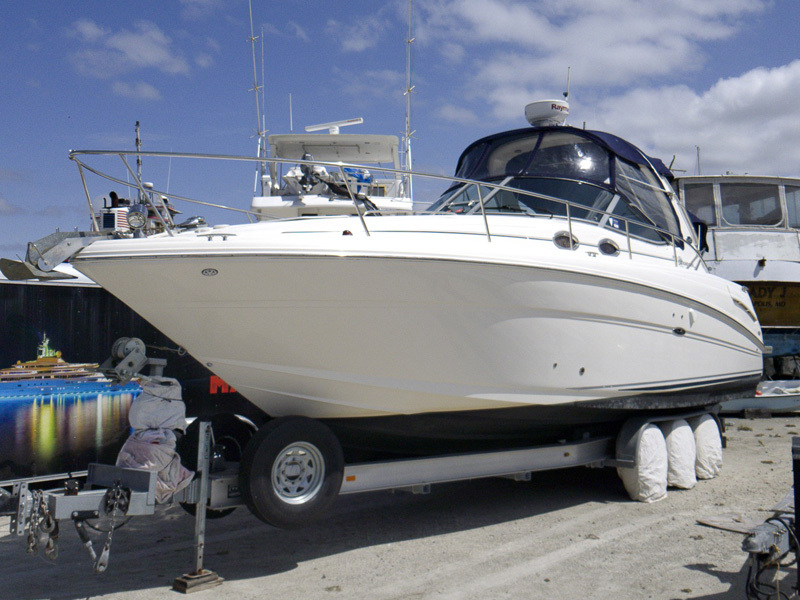 The boat is professionally maintained with all receipts and has the upgraded 350 Mag MPI 300 HP Twin engines with Bravo 3 Drives. It has the optional 5 KW Generator, AC and Heat. 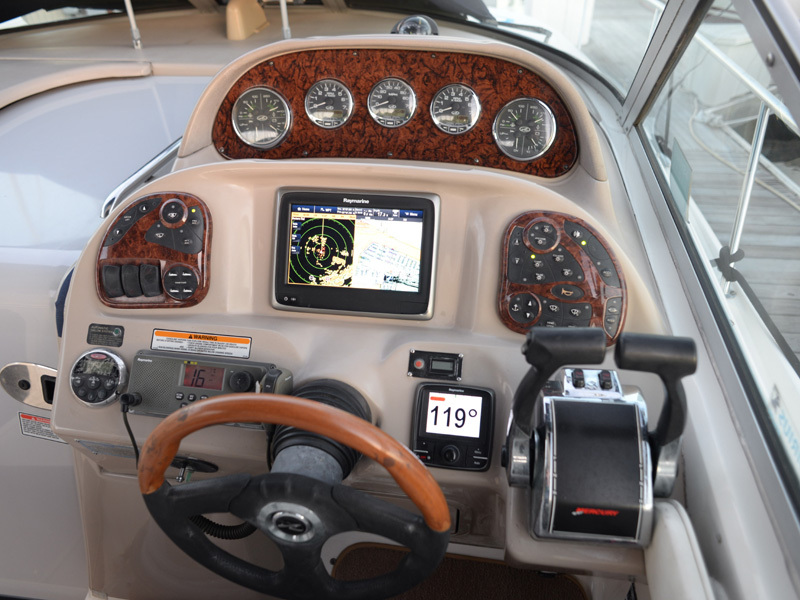 Electronics are updated to Raymarine a98 MFD chartplotter, AUTOPILOT, AIS, HD radar and depth display. The salon is the highly desirable “Plan B” version with pull out crescent shaped sofa, storage below and cherrywood cabinet trim. A refrigerator and 2 burner electric stove are in the galley. There is an updated 24″ Smart TV in salon and drop down 12 volt TV in the mid cabin. The 4 batteries are AGM with a professionally installed smart meter reading amperage in and out for exact battery charge condition. Solar capability is installed and the portable solar panels included. WiFi is available throughout the boat via a professionally installed external antenna, signal amplifier and internal wireless router. There is a Clarion Stereo with helm remote, stern underwater lights and a windlass and anchor with cockpit and forward pedal controls. The boat includes a remote mounted spotlight. 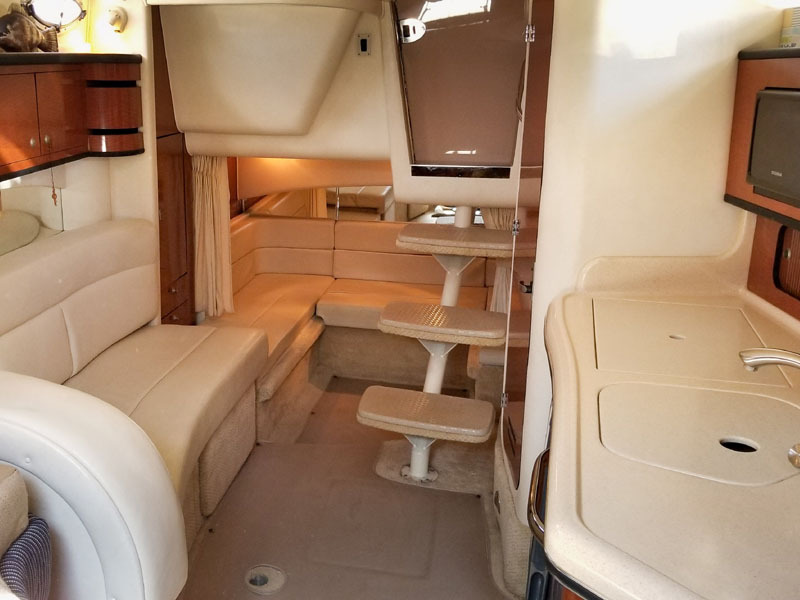 The camper canvas has been upgraded with custom isinglass and custom bug screens and a full cockpit travel cover is included. The cockpit conversation area facing seats include a factory table and cushioned platform for sleeping or sunning. A bow sun pad, cockpit refrigerator and mounted BBQ are included. Watermaker, dinghy with Torqeedo, truck and trailer available. WiFi is available throughout the boat via a professionally installed external antenna and signal amplifier and internal wireless router.